Founded in 1920 by Glenn Hill and Fred Hamilton with an intense desire to provide Logan County residents and businesses a better insurance experience, Hill & Hamilton Insurance began its storied tradition. Current owner, Tom Simon, joined the agency in 1981 and completed his acquisition on March 4, 1993. Under Tom’s leadership, H&H embarked on a three-decade journey growing the business to ten times its size compared to when he joined H&H. 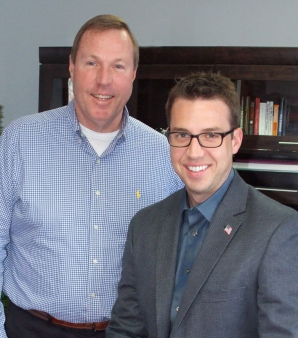 In 2006, Tom’s son, Matt, joined Hill & Hamilton and began an aggressive growth expansion, taking the unique business model and customized insurance experience provided by H&H to clients throughout Ohio. Today, Hill & Hamilton is the largest insurance agency headquartered in Logan County, and is proud to continue the tradition that began back in 1920 of providing a better insurance experience to its clients. Hill & Hamilton provides its clients customized solutions for their insurance needs. Products include personal insurance such as home, auto, renters and umbrella; business insurance for operations ranging from a sole proprietor to those with more than 500 employees; malpractice Insurance to protect physicians & hospitals, consultants to CPAs; and life & health insurance for individuals and businesses. Tom & Matt have served in numerous community and industry positions, from President of the Logan County Chamber, Chairman of United Way, Bellefontaine City School Board President to State Director for the Professional Independent Agents Association of Ohio. Tom is a past winner of the prestigious Richard J. Rupp Leadership award, and in 2013, Matt was recognized as National Young Agent of the Year for his professionalism, achievement and contributions to the insurance industry. Most of all, Tom & Matt are proud of their associates, their dedication to professional excellence, and their unwavering commitment to doing what’s right for their clients. We look at our membership in the Chamber from a global perspective. A strong Chamber of Commerce impacts numerous sectors of our community. When you see quality, accessible healthcare; thriving business and industry; a strong education system; and an engaged workforce, it creates a rising tide that lifts all boats. We want to be a part of that success, and we see our membership in the Chamber as our commitment and investment to creating that rising tide.